Spacious rooms with fabulous sea views, original columns and seating area. 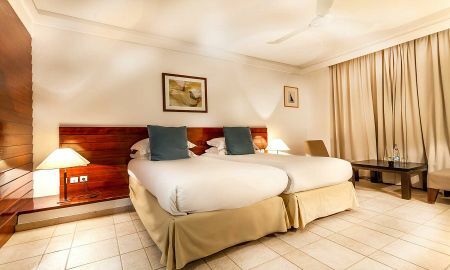 Very spacious and bright rooms with exceptional sea views. The serene and beautiful Mediterranean coast is the backdrop to this gorgeous hotel. Be mesmerised by the natural beauty of the surroundings of the Marina Smir Hotel & Spa, and embark on a journey of tranquility and relaxation. 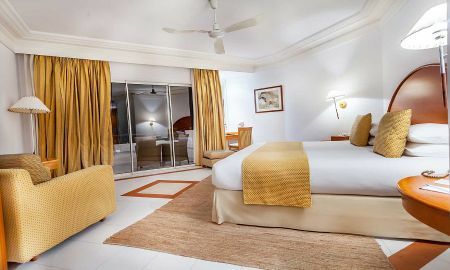 Surrounded by a fine sand beach, this luxury 4* hotel and spa has been designed as an elegant and prestigious hotel, taking design influences from Andalusian-Moorish architecture. The Marina Smir Hotel & Spa invites you to discover its international marina, and many watersports you can try. This hotel is perfect for the contemporary traveller who appreciates quality and style. The friendly staff are eager to help with your questions, and the personal service makes your trip stress-free and one you are sure to remember! The Marina Smir Hotel & Spa is close to several exciting places that Morocco has to offer. The Mesmerising city of Tangier is nearby, where you can admire the beautiful moonlit bays . The picturesque town of Tetouan is also nearby, as is Chefchaouen. 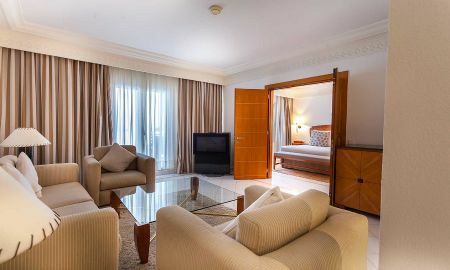 The hotel is 80km from Tangier International Airport. Please note that wellness center is closed for maintenance.